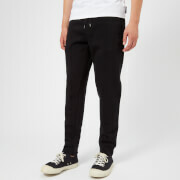 Men’s black cotton sweatpants from Emporio Armani. Crafted from a light, breathable cotton blend, the joggers comprise an elasticated waistband with drawstring tie, elasticated cuffs and welt pockets at the hips and rear. A contrasting branded panel at each side completes the design.